Steve McIntyre has three decades of experience in sustainable winegrowing in the Santa Lucia Highlands AVA. 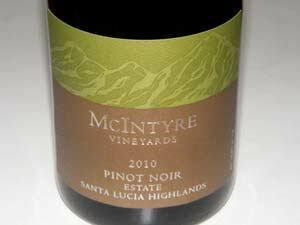 The McIntyre Estate Vineyard is located in the central section of the Santa Lucia Highlands. Originally planted by the McFarland family in 1973, it contains some of the oldest Pinot Noir and Chardonnay vines in the Santa Lucia Highlands. Steve McIntyre acquired the 80-acre property in 1987. 37 acres are own-rooted Pinot Noir heritage clone, oldest in the Santa Lucia Highlands. 10 acres of Pinot Noir 115 and 77 and 13 acres of Chardonnay 96 and 76. 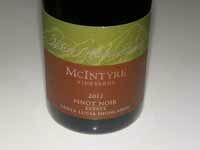 Some of the Estate Pinot Noir and Chardonnay grapes are set aside for the McIntrye Vineyards label (about 15 acres) and the rest is sold to producers such as Morgan, De Tierra, Joullian and La Rochelle. The first vintage for McIntyre wines debuted with the 2005 vintage. Other vineyards sourced for the McIntyre Vineyards label include Mission Ranch Vineyard (Arroyo Seco) and Kimberly Vineyard (Arroyo Seco). Steve and his wife Kimberly started Monterey Pacific, Inc., a viticulture management and development company which has grown to be the fifth largest vineyard management company in the U.S. at over 11,000 acres. Steve was one of the initial founding members of the Central Coast Vineyard Team's Sustainability in Practice (SIP) program. The winemaker is Byron Kosuge. The wines (Pinot Noir, Chardonnay, Merlot and Sparkling) are sold through the winery's website store.